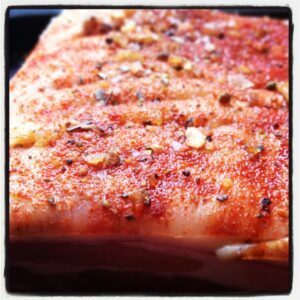 Pork belly is one of my favourite cuts – it’s cheap, produces incredible crackling and it’s so simple to cook if you follow a couple of basic steps. I wanted to take advantage of the sun and fire up the BBQ, but needed to make sure it was throughly cooked, so did most of the cooking in the oven first. I was in a hurry so decided to use some of our Magic BBQ Dust for a fast way to really boost the flavour of the meat. For the crackling, we gave it a kick with some Vanilla Salt because it gives extra depth. Preparing the pork is easy but takes a few hours to really get it right – I normally do this the night before for best results. You first need to score the skin lots of times – your butcher can do this for you. 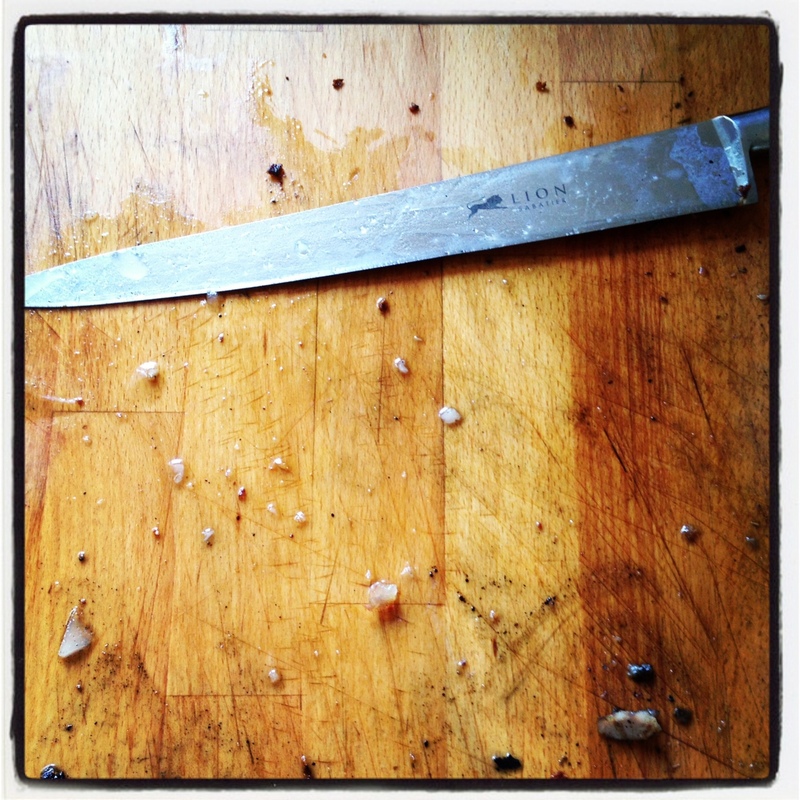 A Stanley knife is best but any sharp knife will do – try and go down deep but not into the meat. The golden rule is it needs to be dry when going in the oven and this is best achieved by carefully pouring a kettle of boiling water over it. This will open up the slits in the skin and, as it evaporates, it will steam dry the skin – just like boiled potatoes steam dry once drained. Pop on a plate and leave uncovered for an hour or so – I usually put it in a cold oven to keep it safe but the draft of an open window would be perfect providing it isn’t sunny and can be protected from anything nasty getting to it. Right, now for the recipe! place on a BBQ (when the coals are grey), skin side up, for around 5-10 mins to get a flame grilled, smokey flavour. Make sure it doesn’t catch fire as the fat drips onto the coals! I tend to get carried away when cooking dishes like this and often forget to take a picture before devouring it. Sadly, this was one of those occasions, so I thought I’d show you what happens when you cook pork this way and put it in front of 4 hungry people!